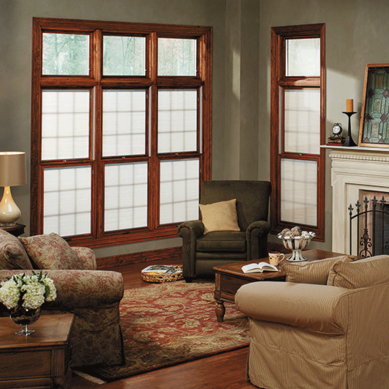 A widely popular choice, double hung windows create a classic and contemporary appearance while simplifying the upkeep of your home. The combination of the low-profile sash and mainframe come together to create a fresh appearance for your home. 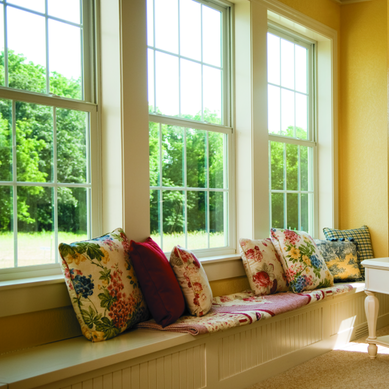 Double hung windows are not only aesthetically pleasing but also highly functional - the energy-saving construction protects your home with a strong, durable shield. Another bonus is their easy-care, easy-cleaning abilities. Both sashes tilt in to allow convenient cleaning from the inside of your home - no ladders needed! High-performance insulated glass unit with double-strength glass and warm-edge spacer system. Integrated construction provides insulating air spaces, which increase energy efficiency and durability. Sash-to-sill nested interlock increases strength to prevent bowing in extreme winds. Sloped sill drains allow for water to be transported quickly to the exterior to help prevent moisture build up. Duralift block and tackle balance system ensures years of easy and smooth operation of the sashes.